The most recent studies of endocrinology have noted a close relationship between gastro-enteric hormones and phosphorus-calcium balance regulator hormones in different physiological conditions. The existence of one or more substances (hormones or electrolytes) capable of completing the last links of this chain is evident. 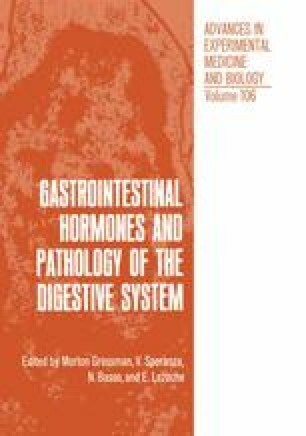 The disorders of gastro-enteric hormones and those of phosphorus-calcium metabolism are always mutually interesting; in fact, hypercalcemia accompanies the highest levels of gastrinaemia in some patients; calcitonin inhibits gastric secretion, and vice-versa gastrin stimulates calcitonin release. Previous studies led us, in agreement with data of other authors, to suggest the hypothesis of the existence of a gastrin-calcitonin system in the regulation of phosphoremia.